I didn’t know it’s recalled until today. I bought this one from Walmart three days ago. It made a blister on my baby’s tongue. I think it was caused when he was biting it, his tongue got squeezed between two beads. I will check the consumer report. Do not buy it!!! 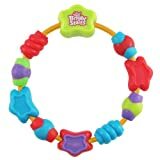 Bright Starts Star teether beads (model 8483 and model 8549) were recalled in 2007. The flexible plastic ring that holds the teether beads in place can crack or break, and the beads can detach, posing a choking hazard to infants. Make sure you aren’t buying one of these recalled items. There is a necklace with the same beads, which is my favorite. The necklace will entertain a baby while you hold them, and a must have for any mom, or cool dad.